Does your loved one run after you for a kiss the second you walk out the door? Do they call you at 1 am begging you to come over and kiss them goodnight? Do they stand on the train platform and blow you kisses 30 minutes after your train already left? If so, then this is the perfect Valentines day gift idea for you! Introducing a kiss in your pocket. First, take a picture of yourself blowing a kiss. 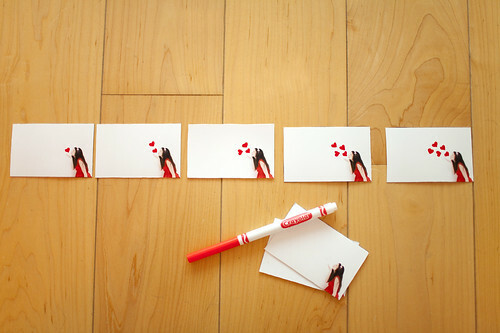 Then print a bunch of little pictures and use a red marker to draw one heart on the first picture, two on the second and so on..
Punch holes on the end and tie it together with ribbon. You've just made a kiss flip book! No longer will your loved one feel clinically depressed when you're away since they'll have your kiss right in their pocket. I Like the flip book! is a BIG IDEA!!! you are great!!!! I love this idea! My husband is exactly that way and will LOVE this too!!! oh god, I am so doing this for valentine's day! Matty is a lucky guy! You are amazingly creative! I love love love this idea ;) SO CUTE! and that red dress is crazy amazing! Hey girlie! I found your super fun blog thru Brooke at Playing Grown Up! I can't wait to cruise around your little corner of the bloggy world! AWESOME! I'm so doing this! love the flip book idea! i wanna do that! Ah! I'm totally using this idea for the boyfriend. You're brilliant! Thanks for sharing! LOVE this! Such a great idea. So cute! Thanks for this idea. p.s. I posted your cute little interview today. Thanks again for doing it! That is a really cute idea for a child too. this is so cute. i love all your projects! Clever girl! I most certainly will use this idea- for many things, mostly zombie attacts. What a great Idea! I might do this for my valentines. ah! i love it! i am going out of town for 10 days. (10 days!) and this will be perfect to leave for the husband. cutest thing i've seen in a long long time<3. I really love this idea :-) So cute! And now I know what my boyfriend's getting for Valentine's Day. Thanks! I am defin making one of these! So cute! What an adorable idea! That is such a cute idea! I am going to do that def. This is so sweet - I think I'd like a kiss in my pocket! Sweet genius. This is awesome. Another creative and fun idea! Thanks for sharing and inspiring! what a clever playful idea!!! You're so creative! This is really cute. I'm gonna have to try it now too. What a lovely, lovely idea and so beautifully made. Your ideas are always so clever. I've been married 35 years...the thought of my husband running after to me to give me a kiss made me laugh. Kiss me before I leave...always, run after me for another one...nope! btw i just watch ur mini documentary and its sooo good..LOVE it, too. Totally gonna do this if I can, such a cute idea! I'm going to make one for my grandson! THANKS! I'm so happy you all like the idea, thank you! I would love to see your flip books if you guys make any! p.s. I'm sure you've been told a million times, but you are so creative! There hasn't been one time I have paid a visit to your sight and not smiled. Thanks for providing a bit of daily inspiration! Excellent, excellent idea! MUY DULCE!! I don't have a bf, but I can do that for my friends, for my mom, etc. 1. I wish I found you four years ago. 2. I wish you blogged about this four years ago. 3. I would have totally used this idea and send this to my boyfriend while still long distance. 4. Because it's so incredibly adorable and cute, I think I will do this idea anyway and hide it in his car when he leaves for classes/work. Whew! Such a dilemma, those kiss-addicts! Don't know what I would've done without this! i'm totally doing this for valentines day!! awesome! That's so dang cute. Gosh, I'm totally trying this. :) Love your thoughts!! Oh, Alex is gonna love it! i just stumbled across this blog, and my heart is bursting with joy as i look at all of your projects and photos. oh my word. your mind is just darling. Great blog you have, pls keep on bloggin! This is the cutest thing I think I've ever seen. This is SO cute! I can't wait to make one for my hubby! You are fabulous, how adorable is this idea! I am making one this weekend. i really do enjoy stopping by this blog. you are such a happy person, as well as crafty. i can't help but feel creative after i stop by! You just have talent to no end Katie! Thanks for the idea. haha you're the best Melissa! this is a great idea for valentine's day! very fun! Who WOULDN'T want to receive this??? I wish someone would make me a card that cool. If my camera wasn't totally dead without a charger we would totally be making this at our house! this is amazing. i can't believe I haven't seen your blog before. this is pure magic. love it! This is going to sound kind of totally crazy, but i'm kind of totally crazy so... well i'm DYING to hear your voice! You're so crazy and wonderful! i guess i'm just curios. you should make a video just talking. We were doing a shoot the entire day so by the time we did the interview I was pretty exhausted. I usually have more energy than that! oh my gosh amazing. Your blog is always so inspiring to me! how can it be that you're so happy and brilliant and creative?! LOVE this idea!!! that is sooo cute! And very creative too!! You are aweome. My 10 year old daughter loves your blog..your ideas, your photography, and of course your cat!! 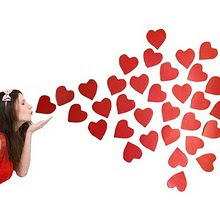 That's such a lovely idea...kisses not just for Valentins but for all year long. I love your blog! I just found you from the interview you did with Brooke Premo at Playing Grown Up, and I can't wait to dive in further. Thank you for not only making such fun art, but showing us how to do it too- it's so inspiring! Such a sweet idea! Of course, it helps that you're gorgeous! it's such a beautiful idea. Love that magic curtain show too. such a cute idea! Totally making one for my boy :) Thanks for sharing. Absolute amazing paper genius-ness! Thanks so much for sharing this! I took the picture this afternoon - I can't wait to make my flip book! How many pages do you recommend using? What a great idea Katie!! Thank you! SUCH a cute idea. precious. Will be sure to let you know how it turns out! This might just be cuter than custom conversation hearts!! I'm adding your little project to my "week of love" posts! This is such a cute and great idea! Thank you for sharing! Thanks to your inspiration Katie, I made a flip book for my hubby. I just wanted to share with you ---shhh, still top secret till Sunday --- that I made this for my boyfriend. I had so much fun, it was a great idea. I hope he likes it too! 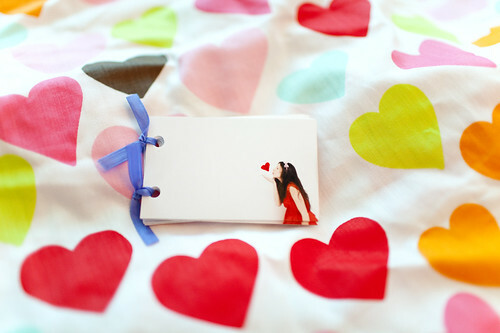 Thank you for the lovely idea - I've just made my little flip book and can't wait to give it away on valentines day! this is the most adorable tutorial this holiday I have seen. thank you! I just posted a link on my blog to your brilliant creation. And my pen ran out!! Darnit. This is absolutely amazing! I can't wait to make one! I loved this idea so much I made a little animated one myself in Photoshop. Here's my version: http://i382.photobucket.com/albums/oo266/jenniferstuartdesign/happyvday.gif Thanks for the cute inspiration!! This was such a great idea! I made one for my boypiece for Valentine's day. I took a series of pics to show myself laughing. I absolutely love this!!!!! You are awesome. You are a genius! Thanks for this! Hi Katie, this is simply genius! I made one too! This is so adorable! I want to attempt it now! haha I love that. I must remember this so I can attempt it someday! I loved this idea so much that I linked this post and your video on my page Show your love on Squidoo!. In exchange for the 'kiss book', I offer some Hugs! you're so cute and amazing! great idea! i wanna try do it, and all the things that you do. I'm from Venezuela and i love you blog. My blog is http://rossanilla.blogspot.com/ kisses. Looking for this argumentative essay I decided to do something like you made. Awesome, this was a really quality site. In theory I'd like to write like this too - taking time and real effort to make a good site... but what can I say... I procrastinate a lot and never seem to get something done. This is so sweet and cute! It'd also make a great gift for a grandparent with their grandchild blowing the kisses! What size pictures did you use?? Thank you! I looooove this idea! I'm going to make a card for my wedding anniversary which is coming up ... YIKES I have a few days to create this and slip it into hubby's suitcase. THANKS so much for the beautiful inspiration!